TOKYO, Aug 16 (Reuters) – Asian shares rose to one-year highs, extending their gains so far this year to almost 10 percent, helped by a jump in oil prices and investor expectations of continued easy monetary policy around the globe. MSCI’s broadest index of Asia-Pacific shares outside Japan edged up 0.2 percent, bringing its gains so far this year to 9.9 percent. 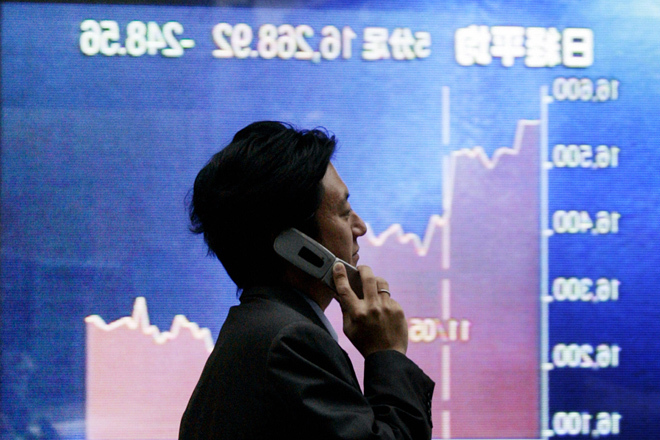 Japan’s Nikkei was almost flat. On Wall Street on Monday, S&P 500, Dow and Nasdaq stock indexes all closed at all-time highs, gaining 0.3 to 0.6 percent. Brazilian shares also hit two-year highs, helped by higher oil prices. Brent crude traded at $48.18 a barrel in early Asian trade, down 0.4 percent from Monday but still not far from Monday’s high of $48.46, its highest since July 12. In currencies, the dollar slipped slightly but was essentially stuck in its recent trading ranges as market players look to the minutes from the Fed’s July policy meeting, due on Wednesday. The dollar’s index against a basket of six major currencies stood at 95.60, after having slipped 0.1 percent on Monday. The euro fetched $1.1182, off last week’s high of $1.1222. The yen stood at 101.20 to the dollar, little moved so far this week.